This is a rare case when the music I put here at avax is not ripped by myself. Credits should go to xudong at Demonoid. 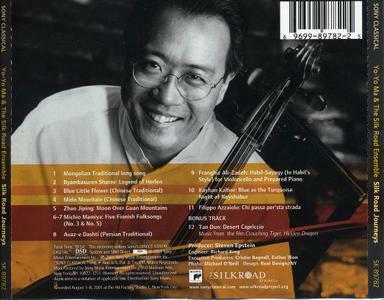 I just upload it to return and complement Jozzie's recent upload of the music of the Silk Road at http://avaxhome.ws/music/silkroad.html . The purpose of the Silk Road Project is to illuminate the Silk Road's historical contribution to the diffusion of art and culture, identify current voices that best represent this cultural legacy and support new collaborations among artists. This is their first CD, published in 2001 as the result of a two years long collaboration of over 40 musicians from around the world. Every file is 50 MB, except for the last one which is 18 MB. Booklet and cover scans included.